Our Lady of Mercy Catholic School provides foundations for a life of prayer, knowledge, and service. All that we do is inspired and informed by this mission, beginning with the religious formation that our students receive at school. As children come to know, love, and serve Christ, they develop an understanding of their eternal goal: living with Him in Heaven. Through the combined efforts of the principal, director of religious education, teachers, and parents, the spirituality of the students at Our Lady of Mercy is nurtured and strengthened at all grade levels. With integrated religious instruction and ample opportunities to deepen the life of faith, students at Our Lady of Mercy come to know the love of Christ through every aspect of their school experience. Students begin each day with prayer at an all-school assembly and attend religion classes daily. Faith is incorporated in the classroom as teachers utilize resources like the Bible, the Catechism of the Catholic Church, and Church teachings to enhance lessons. 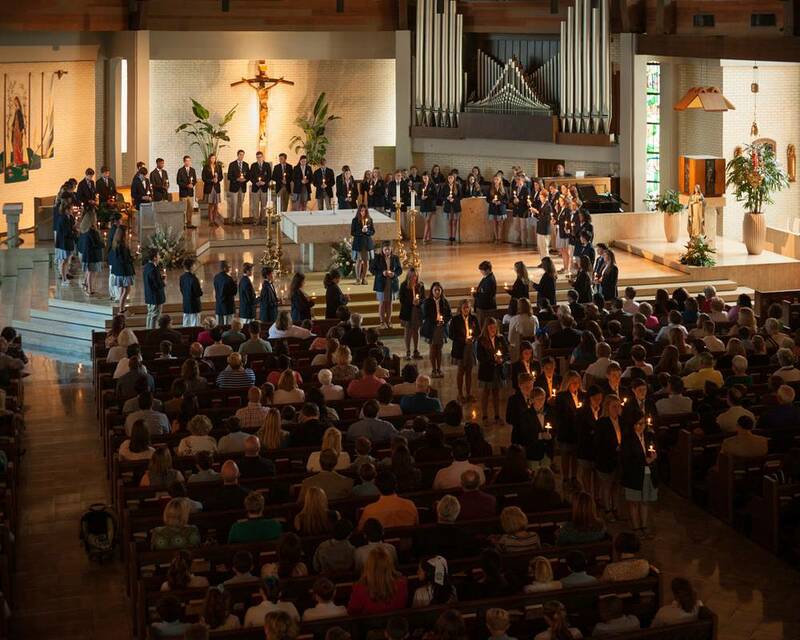 Students attend all-school Mass twice a month and on holy days of obligation, uniting themselves with the prayers of the school community and the Church universal. The Sacrament of Reconciliation is offered each semesters to help students open their hearts to God's love and mercy. Devotional and seasonal activities such as the Living Rosary, First Friday Adoration, and the Way of the Cross put students in touch with the living traditions of the Church's liturgical calendar. Eighth graders participate in "Come, Lord Jesus!," a Scripture sharing group facilitated by parents. Students and faculty joyfully live out the Church's mission of social justice by reaching out to the local community through service projects in class and school clubs. Our Lady of Mercy strives to instill a Christian lifestyle through instruction as well as example. Teachers nurture their own personal spiritual development through faculty retreat days throughout the year. Parents and families are invited to be directly involved in the spiritual life of the school by participating in prayer at morning assembly, sitting with their children during school liturgies, and joining the Moms in Touch prayer group or the Mercy Men of St. Joseph. Our Lady of Mercy is a community of faith where students, faculty, and families share Christ's love and work together to build the Kingdom of God.